I am cautiously hopeful for bitcoin. I just ate pizza and poutine with a group of friends, paying at the restaurant with bitcoins! I am not a speculator. I am not an investor. I am not a miner. I am not trying to get rich nor make any money whatsoever by manipulating bitcoins. I just want to be able to earn and spend money on the internet without needing the permission of a bank, or the permission of Paypal, or making it anyone’s business but mine and the person I’m actually doing business with. I acquired some bitcoins about a year ago, at the time it was about 1.8 bitcoins worth around 30 USD. I did not buy them. I did not invest on bitcoins. I did not mine them. I received them as a payment for tutoring mathematics in an IRC channel for an hour and a half. I earned these bitcoins through my labour, just like I would earn any other currency. At the time there was not much I could do with bitcoins. Although I freely encouraged and accepted the payment in bitcoins, I did it more with amusement than conviction. I am not a criminal, but since at the time Silk Road still had a sort of forbidden underground allure, my client suggested that I could use the bitcoins to buy illegal drugs on the black market. I had no intention to do so, but I decided to keep the bitcoins around, as a cautious hope I could use them for something else. I kept the bitcoins for quite some time, since I could not find anything to spend them on. The first thing I could find that seemed interesting was a 4chan “account” (in reality, just an exemption from its captcha). Despite the website’s bad reputation as being the cesspool of the internet, I think that there is value in its pro-anonymity ethos, something that is slowly being eroded away in today’s online world. This was also my first test case for the possibility of anonymous online currency. In keeping with this ethos, I made the payment, and when there was a slight hiccup with the transaction, used a throw-away email address to resolve the issue. No chargebacks, but people are still people and are still mostly nice. I thus obtained my 4chan captcha exemption. I have not really used it since then, but I am satisfied knowing that I have made a small contribution towards promoting anonymity. I kept my eye out for news stories of more opportunities to spend bitcoins on. The currency seemed to be slowly gaining more adoption, especially for non-material goods and services. My next purchase was one month of reddit gold as a gift for a particularly witty commentator. These two purchases together had already given a significant blow to my bitcoin balance, but I was not duly concerned. After all, this was just pocket change I acquired for 90 minutes of a hobby task. Then, suddenly, over a couple of weeks the bitcoin price exploded from 20 USD per bitcoin to over 1000 USD per bitcoin. I didn’t exactly become a millionaire, but my paltry fraction of a bitcoin now had the power to buy more things. I made a few more purchases. A PDF copy of Julian Assange’s et al Cypherpunks book. A month of VPN access. Sent bitcoins to a kind stranger on the internet in exchange for digital albums from indie band Nectarphonic. When Gyft.com started selling gift cards to Amazon.com in exchange for bitcoins, I obtained my first physical product for bitcoins: a boxed set of Susan Collin’s The Underland Chronicles. This really had just been my time getting used to bitcoin and how it works. The fluctuations in price, the cryptography behind it, the UI presented first by the “official” bitcoinqt client and understanding more how the alternative bitcoin client Electrum works. The security model, what it means to “own” bitcoins. Passwords and private keys. The workings of the blockchain. Using Tor for enhanced anonymity of transactions. I finally got around to reading Satoshi Nakamoto’s whitepaper. Wow. I don’t know if this person or group is a genius or just a child of the times, but Nakamoto seems to have solved a cryptography protocol problem that nobody had solved before. Nakamoto didn’t invent the idea of cryptocurrencies, but merely built upon the ideas of others in order to build a decentralised system. I was duly impressed. 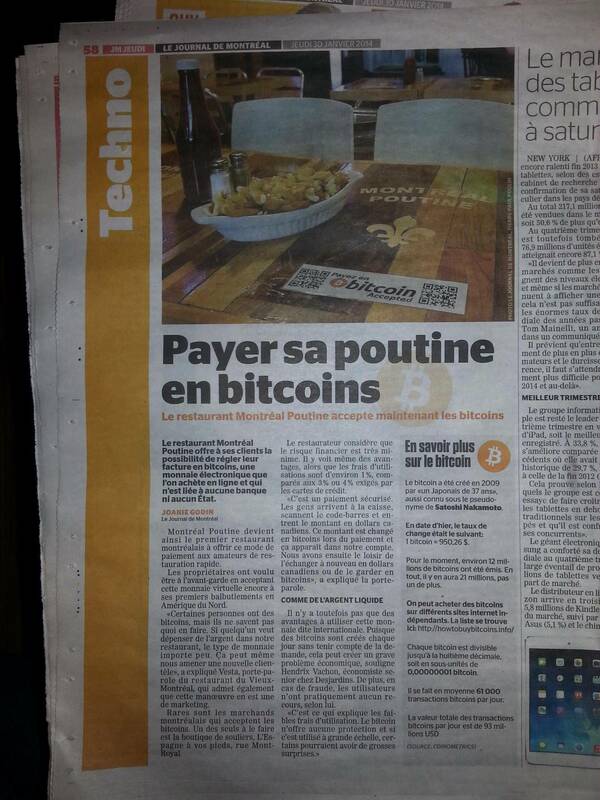 Then two days ago I saw that the first restaurant in Montréal was proclaiming to accept bitcoins. I could now buy Québec’s signature dish, poutine, with bitcoins! Excited, I started making plans. I eagerly announced yesterday on IRC that I was planning to go to this restaurant to try out my bitcoins. Another chatter local to Montréal decided to tag along for fun. We made plans to go that very evening for a night of socialising, three couples. I eagerly explained to everyone my excitement over finally being able to pay someone face-to-face with bitcoins. My fiancée and I got to Montréal Poutine in the Old Port a few minutes earlier than everyone else. It was a small location, hardly more than a greasy spoon, but par for the course for a poutine joint. There were signs all over the establishment announcing the possibility of paying with bitcoins and a wifi password on their chalkboards. We eyed the menu, and I nervously made a few preliminary checks to ensure the transaction would go smoothly. Due to one of my many quirks, I do not own a pocket computer (“smartphones”, neither smart and hardly phones), so I was prepared to pay with my laptop and a webcam for scanning a QR code. I ensured that the internet connection was stable and that I could scan a QR code. As instructed in bitcoinaccepted.ca (or in payezenbitcoin.ca, because this is .ca), I proudly announced to my server that I was going to pay with bitcoins. “Oh, wow, it’s my first time,” she said in French. “Mine too,” I replied with a smile. Our company arrived, the two other couples. We ordered various kinds of poutine, pizza, avocado fries, beer and mineral water. We chatted about many things, and soon predictable discussions about bitcoins ensued. Their method of operation, their security, their volatility but recent relative stability. Musings if they would ever work or not. The more techy in the bunch were showing signs of optimism, while those who found the idea more foreign were predicting the eventual doom for bitcoins. After a very pleasant evening, it was time to pay the bill. I announced that I had enough bitcoins to pay for all the food, but I asked everyone else to divvy up the drinks between them. I also told them that I had read that tips were not accepted in bitcoins yet, so that would have to be paid elsehow. I readied my laptop and the webcam, to the growing amusement of my companions. The server came with one bill for food and another for drinks. I reminded her that I was going to pay with bitcoins, but I wasn’t quite sure what to expect. I had seen videos online of handheld machines that displayed a QR code with the bitcoin address to pay to, and that was my guess for what I would see. Instead, she pointed me to a static QR code pasted next to the cash register. Was this the bitcoin address to pay to? I walked with my baroque laptop-and-webcam rig over to the cash register, in good fun as I heard my giggling friends behind me. I used Electrum to scan the QR code, looking for the address. Instead of a bitcoin address, this was a Bitpay URL. I wasn’t quite sure what to do with it, and I floundered for a few seconds. I opened a generic QR code scanner to get the URL. One of the guys with us helpfully walked over to help me scan the QR code, but I had already managed to get the URL loaded in Firefox by this time. The server was re-reading the instructions next to the QR code on how to pay. At the Bitpay URL, there were two fields to fill out: an order number and the amount in CAD to pay. The server read the instructions again and said to leave the order number blank. I filled in the amount with taxes, showed it to her, and we agreed it was correct. I clicked enter. A bitcoin address showed up. I went back to Electrum to send money to that address. I stumbled when typing my wallet password. The server, getting the hang of the transaction, said bemusedly, “I cannot help you with that.” Finally I got it, and the familiar “this invoice has been paid” message showed up on the Bitpay website. Everyone relaxed and proceeded to tackle the more familiar problem of paying for the drinks with more conventional currency. I don’t know if bitcoin is going to crash or not. I don’t understand enough economics to comment on what the value of bitcoins is, or if it really is different from the value that we give to any other currency. I have a rough understanding of the cryptography behind it and what makes the whole thing work. I know people are working on making bitcoins more accessible to people less enthusiastic than me, and I very much wish they succeed. All I know is that so far bitcoins have worked for me. I look forward to getting better acquainted with this new way to conduct business. I wish good fortune to everyone else who is also trying to build a new currency for an internet-powered age. Thank you for the detailed story about your experience at Montreal Poutine! I did their Bitcoin payment setup and it’s an excercise in learning and improving, since the first day. Initially there was a requirement to do the payments without having an Internet connection, relying on the customers devices. This is possible but requires a bit more interaction, and Bitpay’s service is not exactly device-agnostic. I’m not exactly sure how to make it easier. I mean, I wasn’t making it that easy on my end, using such an antiquated device as a laptop. I wonder what they did on their end, because they confirmed to me that the payment went through. I guess Bitpay sent them CAD and that’s what they were confirming? Hey Congrats on the fiance part = ] and hurray for Bitcoin. Oh, hey. Yeah, I guess I forgot to mention it. Thanks!